A Zine About Unusual Music and Art. This is a much welcome double-CD set of enveloping electronic sound provided by the undynamic duo of 20th Century experimental music, pianist / composer David Tudor (1926-1996) and composer John Cage (1912-1992). This transcendent live performance is more than an adequate extension of their double-LP from 1959, Indeterminacy, and was recorded live by Radio Bremen in the Bremen Glocke, Germany, on May 5, 1972. 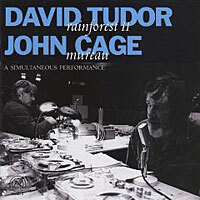 It features John Cage reading a rearranged text of Thoreau mixed in with the homebrew music (hence “Mureau”) of David Tudor’s myriad electronic contraptions. With said equipment, David quilts a whole host of sonic afghans and sets them afloat in a most deep-space-staring manner: at times churning, misting, grating and massaging; evoking bird cries, placid scenery and foul weather density—all topped off by John’s peculiar warbled chanting and moaning of re-arranged text. Needless to say, it’s very beguiling and another essential listen from these two legends. What a treat to hear them together again. You are currently browsing the archives for the David Tudor category.